Carciofi (artichokes) are in season here in Sardegna (Sardinia in English). 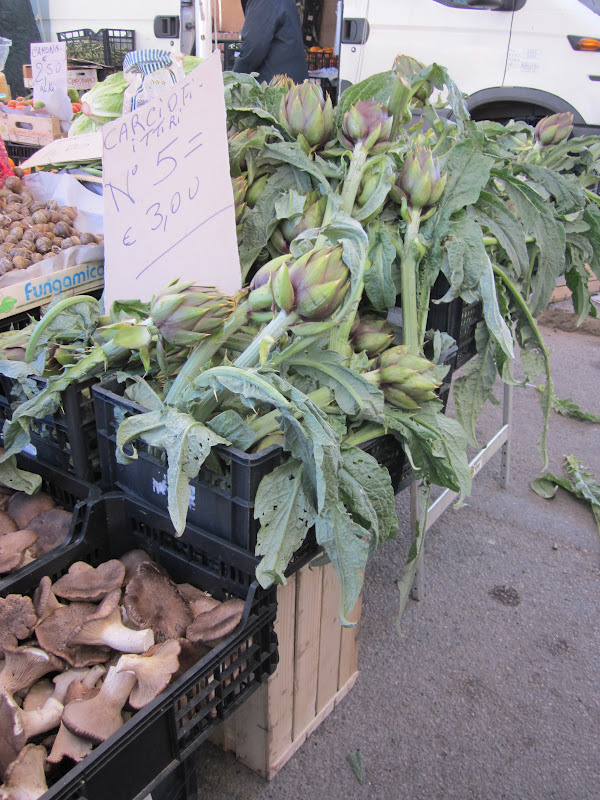 The Sardinian ones are different than the Roman artichokes we are accustomed to seeing on the mainland of Italy or in the US. The photo to the right is of an artichoke plant that has just been harvested. Notice the pointy yellow spikes still on the leaves. 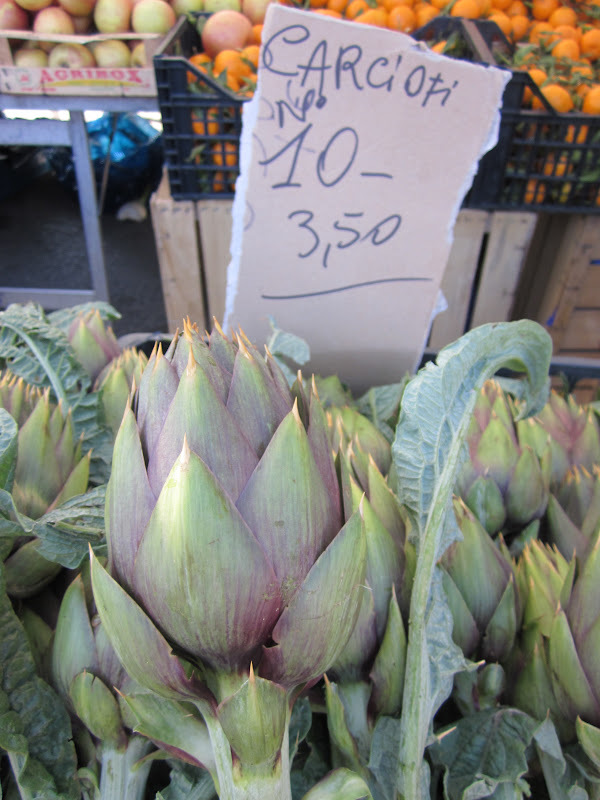 Sardinian artichokes are more narrow, with long stems (delicious to eat) and pointy yellow spikes that come off the outer leaves. The carciofi from Sardegna are highly sought after (as is much of their agriculture, oil, seafood and cheese) and the window of time to eat them is short ... but lucky for me, it's RIGHT NOW! 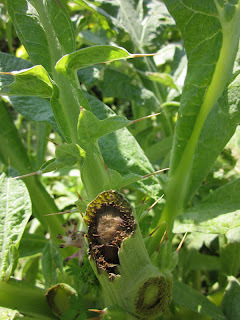 Notice the yellow spikes at the tips of the outer leaves! Carciofi are eaten in many ways ... in salads, steamed and sauteed, preserved under oil, drizzled with olive oil and salt, etc. Below are a few easy recipes you might enjoy with your carciofi! 1. Remove tough outer leaves until you get to the soft heart. 2. 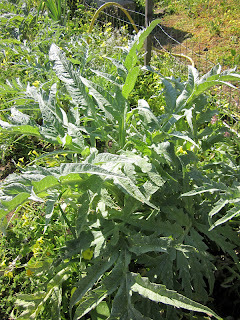 Half artichokes and steam until just tender. 3. Heat pan over medium heat, add oil. 4. When hot, add artichokes, garlic and sautee for a few minutes until perfectly tender. 5. 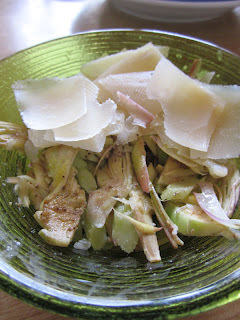 Add a splash of dry white wine (enough to cover the pan 1/4") and let artichokes simmer until liquid reduces by half. 6. Add parsley, season with salt and serve. 1. 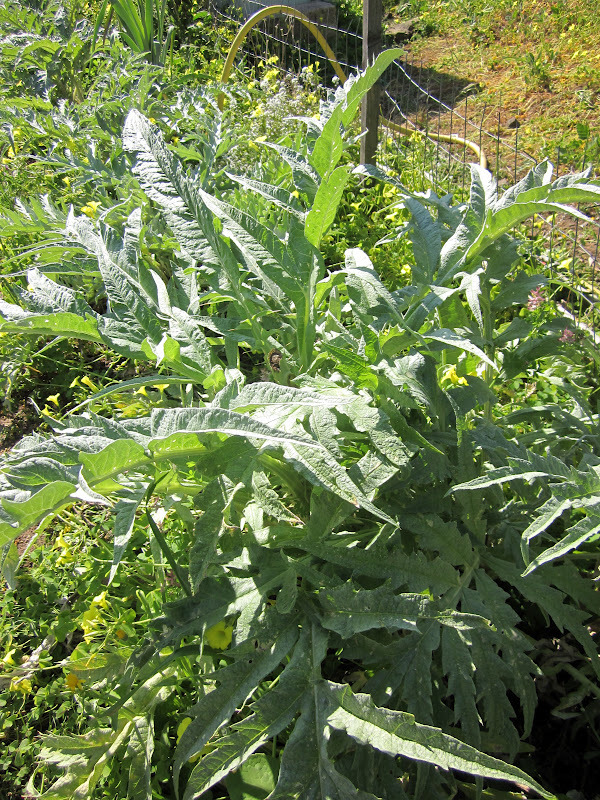 Remove outer leaves of the artichoke and use only the soft heart. 2. Thinly slice heart and drizzle with EVOO, lemon juice and salt. This particular blog entry is dedicated to my new Dutch friends, Ilia and Anne, who love artichokes! We live in a small village (1300 inhabitants) 6 km from the sea in south west Sardinia. Our land is a 5 minute walk from the house and is 4 hectares with a vineyard, vegetable garden and grazing for 30 goats. Help needed with milking, cheese making (only in the spring and summer),harvesting strawberries, preparing artichoke bulbs for planting, in the vegetable garden and vineyard, harvesting olives, harvesting grapes, making wine, grape juice and conserves. This year our son his German wife and their small children will also be living with us. German, English and some French spoken. I will be working from 8-11am and from 6-9pm helping guests check-in and out and with breakfast prep and basic cleaning. From 11am-6pm, I have the day free to explore this beautiful beach front touristy town, including hiking Mt. Etna (volcano), and going to the Aeolian Islands, beaches and other nearby towns. On my farm in the Iblee hills of Siracusa Monte Favara I rear sheep, in the valley is a spring "Sorgente S.Giovanni" and the whole area is of great archaeological interest with many caves and tombs from the Paleocristana era. The jobs which we need help with are making cheese and ricotta from the milk which arrives at the farm from the flock which is on a nearby farm, cleaning, in the vegetable garden and in the kitchen. Help also needed with maintenance and clearing the grass round the archaeological part. 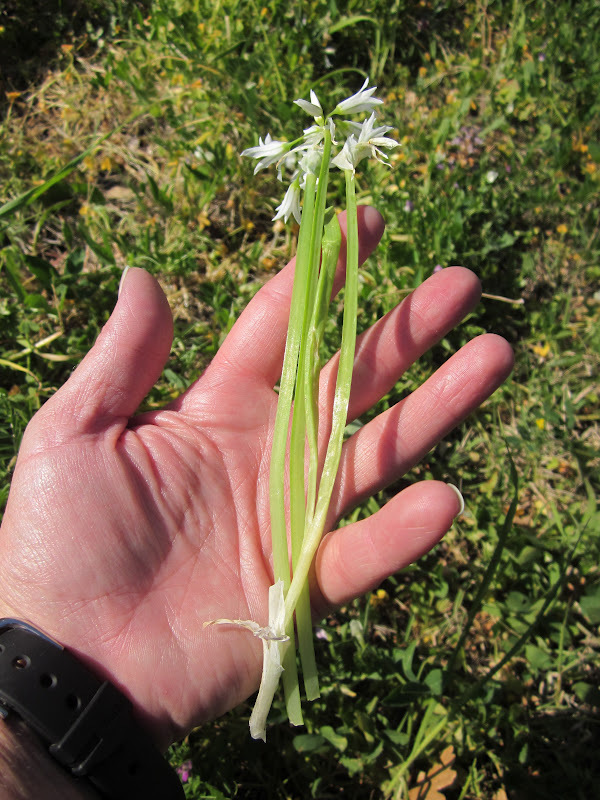 From May to August we also collect wild capers, fennel seeds, asparagus, mushrooms and other wild vegetables. We have a typical Sicilian diet using our produce and old recipes, we also make bread in our wood burning oven. In Puglia… not sure where yet. 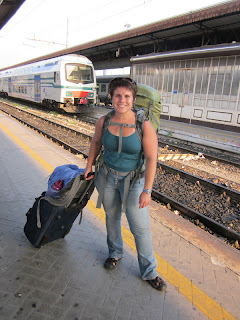 On October 5, 2011 I left Italy for the 4th time. 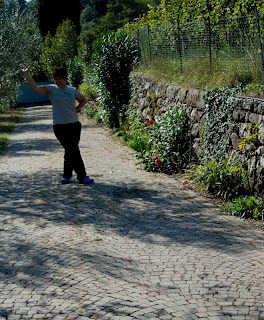 I was really sad to leave … the beautiful landscape, the people and most importantly, the cuisine!! I had a very special time living with, learning from and eating with Italian families in Tuscany and all over the northern regions. I traveled as far south as Orvieto and as far north as you can possibly go and still be in Italy (Courmayeur). I ate too many types of pasta to count, had gelato every day I could and picked organic farm fresh veggies to nourish my body. It was a life-changing experience that I will never forget and that I had hoped to continue in this coming year. In order to make sure I would come back, I purchased a pre-paid phone card and took out a few hundred euros in cash before I left Italy. I thought that “financial commitment” would be enough for me to insure I would return. While at home, I worked part time as a hostess in an Italian restaurant in Palm Harbor and also as a holiday sales associate at Williams-Sonoma. I loved putting my new-found Italian knowledge to good use by sharing with my co-workers and guests. 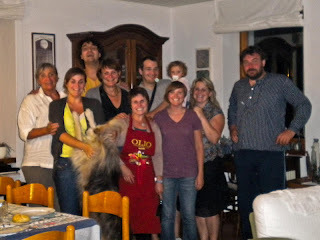 While in Colorado and Florida, I taught regional Italian cooking classes to friends and former co-workers. They were a hit and the "students" wanted me to teach more! (Who knew that a girl with a culinary degree who has worked in F&B for over 10 years could teach cooking classes? HA! This one!!). 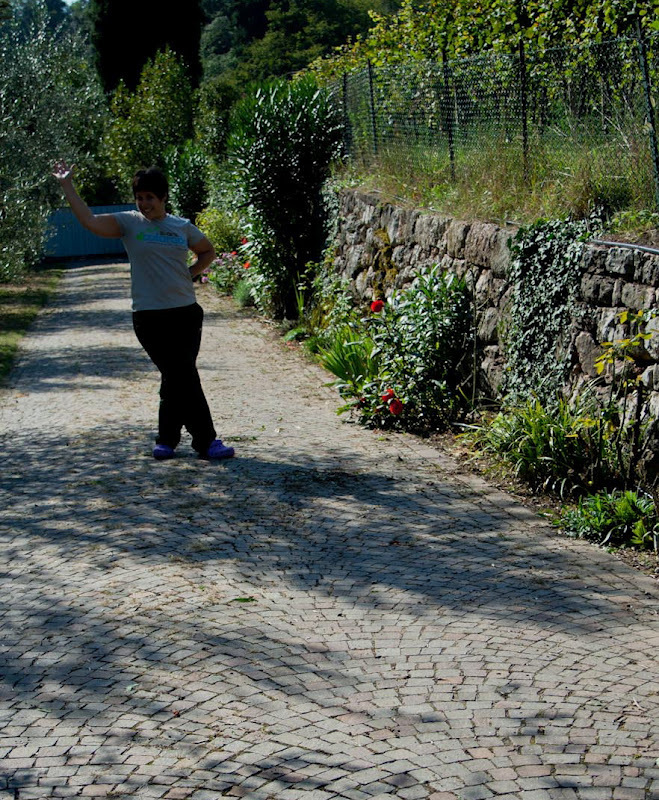 After the success of these classes, I decided that there was only one thing I had to do with Italy. FINISH IT! 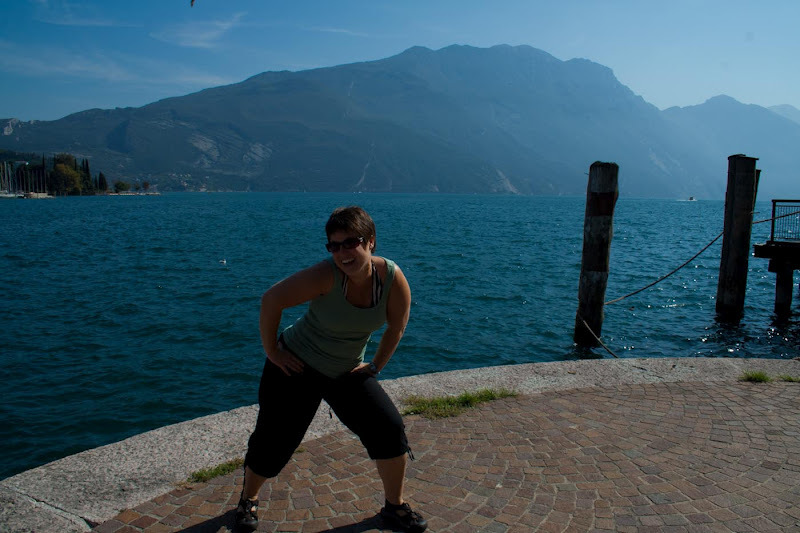 For 2012, I will be strategically placing myself in the southern regions of Italy. A month in each: Sardinia, Sicily and Puglia. I will be living and volunteering with families on their farms, agriturismos and in a hostel. Looking very forward to learning about the coastal and spicy cuisine of the south!! Also on the job front, I have contacted a few culinary tour companies, travel companies, hotels and have looked into some other potential job opportunities. I am bringing my resumes with me and have an "interview outfit". To top it all off, I have applied for German citizenship and will be receiving my citizenship papers while I am back in Italy this year--- this means I can legally live and work in Italy as it is part of the European Union, just like Germany. Also, I bought only a ONE-WAY ticket back to Europe this time. SO, all this means that I am going back to Italy for sure. The question is ... when will I return home to the US? I'm really not too certain on that one. What I do know is that I am in for the culinary adventure of my life in this next year. And I also know that southern Italy is just where I want to be for the next 3 months. Wish me luck! And stay tuned for some delicious recipes to come! A former international student and co-worker from The Broadmoor was kind enough to meet up with me in her hometown of Trento and take me along the Strada del Vino (Road of Wine) in the beautiful Alto-Adige region. 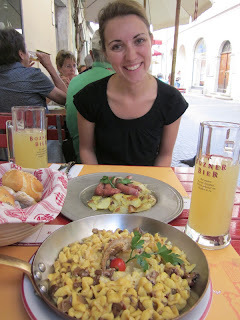 What a great surprise to join Nadia for a day of delicious "German" fun! As the name suggests, the Trentino - Alto Adige region is composed of two separate areas. 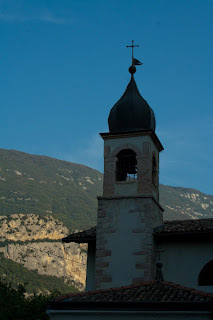 Trentino refers to the southern part of the region with it's capital city of Trento. The name Alto Adige is the northern part of the region that includes the higher (alto) part of the Adige River. One main distinction between Trentino and Alto Adige production is the fact that in the northern areas the wines are produced mostly by small family-owned and managed wineries that sell their product locally with limited exports to Germany and Austria. 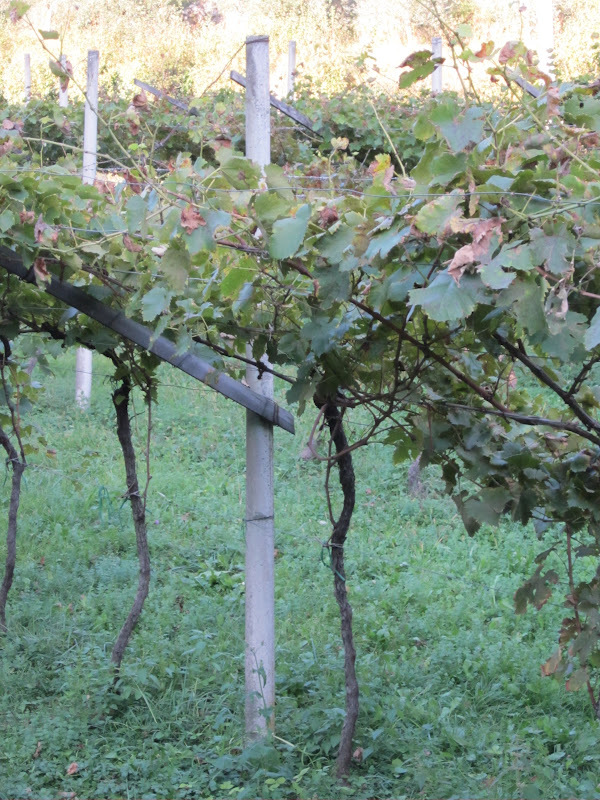 Trentino, however, counts on a large number of growers who joined into large cooperatives such as Ca'vit and Mezzacorona, which product wines that have consistent taste and characteristics each year. This was one of my favorite stops for the day- wine tasting with a knowledgable and adorable wine store employee. 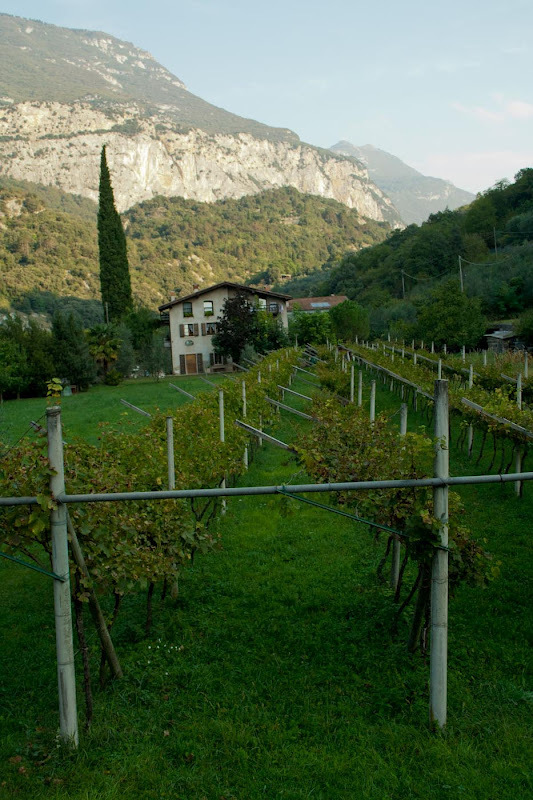 Did you know that the Trentino - Alto Adige region produces less than 1% of the national wine production of Italy? However, it also accounts for about 10% of grappa production! 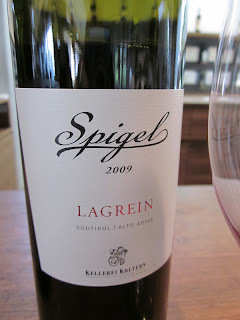 Lagrein is a big red from this area- it is kinda like a syrah. I love it! There are actually three grapes native to this region. One is the white Nosiola and the other two are the red Teroldego Rotoliano and the Marzemino. 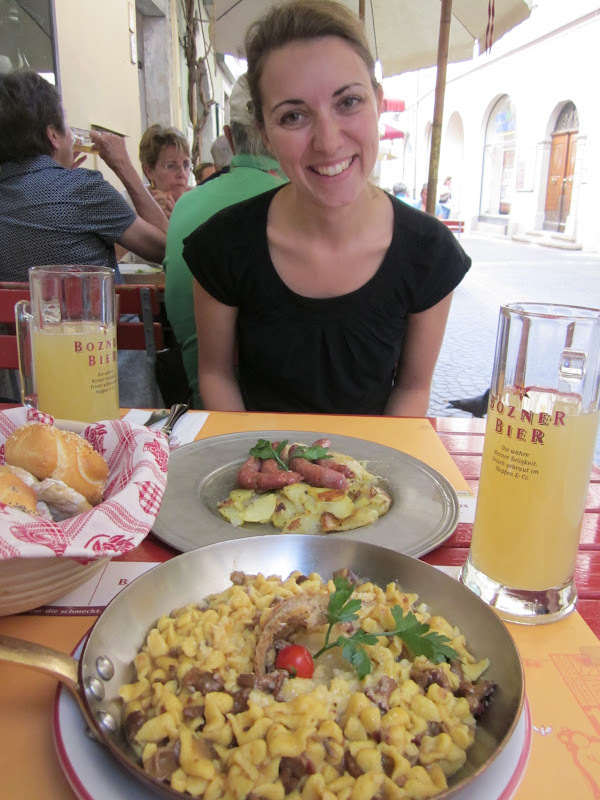 We ended up in Bolzano for the day. It is in the very far north (east) of Italy and feels SO German! Signs are in German, menus are in German, newspapers are in German, and they even speak to you in a restaurant in German. This is my favorite sign and really symbolizes my memory of Bolzano. A "pizzeria" sign with a very German decor. 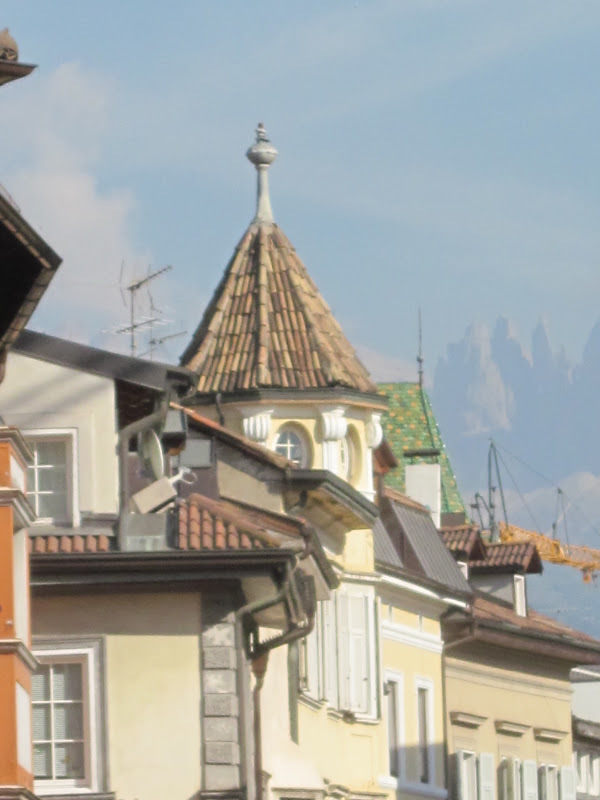 The Dolomites are in the distance and are a beautiful backdrop. Reminds me of the view of the Rockies from Denver. Biggest beer selection I saw in all of Italy. 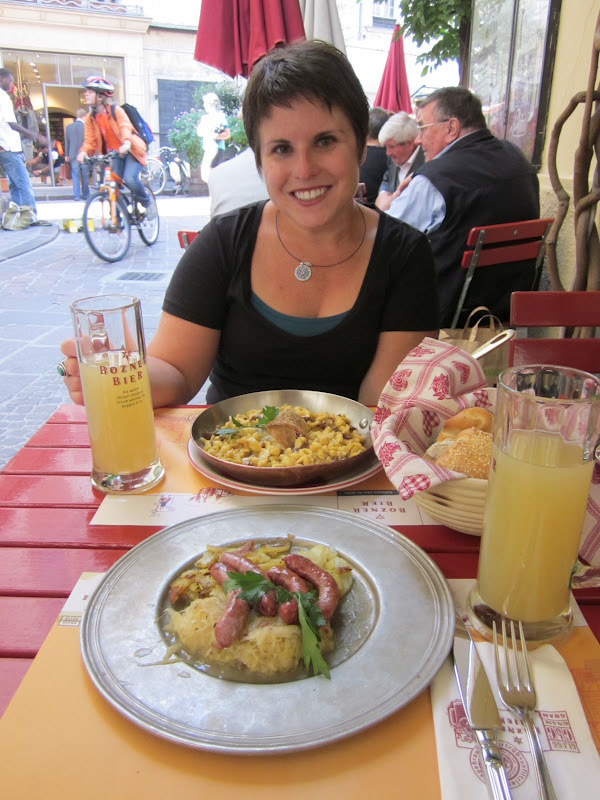 Luckily Nadia speaks fluent German in addition to Italian so she was fully able to order our spaetzel and sausages with potatoes! I, on the other hand, sat there and enjoyed my sparkling apple cider! View from the train from Bolzano to Trento, rows and rows and rows of vines set against spectacular mountains. I took the train back to Trento and immediately noticed the difference, leaving "Germany" and coming back to "Italy". Even the clothing here makes it feel much more Italian. I just love how Italian woman always look so sleek. I wish I could pull this off for my evening bike ride! 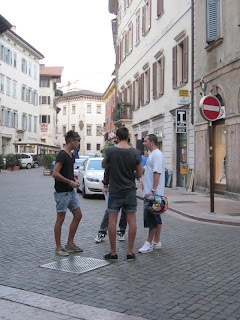 Young men chatting in the street. The rolled up jean shorts and helmets in hand scream "Italian". It feels good to be back! Surprise! Kiwis grow in the north east of Italy! Who knew?!?! 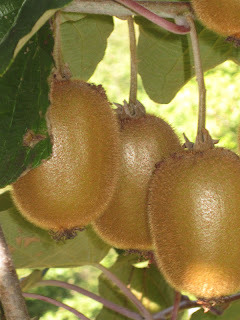 "Lucky" for me, I have a "gift" that allows me to smell their stinky sweet fragrance so I know when I am within 50 feet of a kiwi tree, with out even seeing one. For my last week in Italy for 2011 Reva and I stayed with a lovely family in the town of Arco, just on the north bank of the Lake Garda (Lago di Garda). 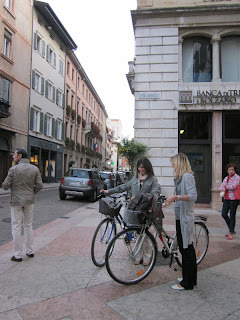 It was a bit of culture shock when we arrived because it felt much more like Germany than Italy. 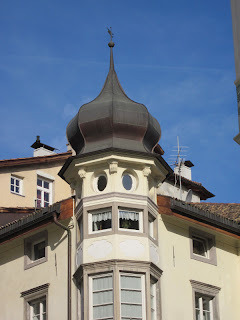 The food, the architecture, and even the organized sense of time and space were much more Austrian/German than anything else we had experienced. 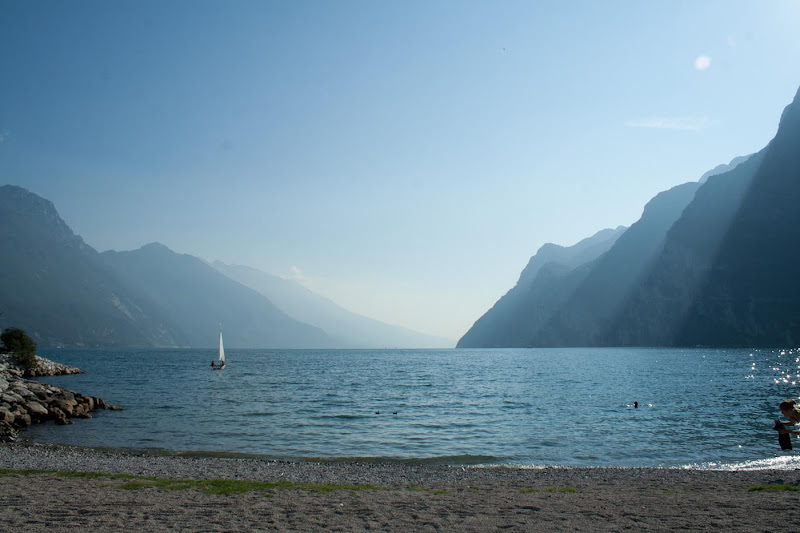 Lago di Garda is known as the lake for adventure sports (windsurfing, kite surfing, kayaking, etc.) 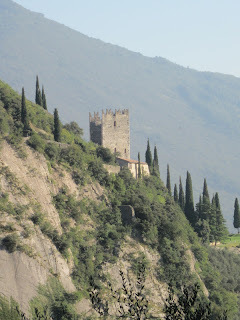 and the town of Arco is world famous for it's rock climbing. 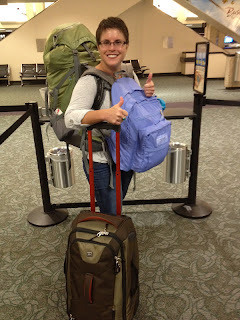 Needless to say, I felt very much at home with a North Face store in town and a lot of gear being hauled by people around me. The cypress trees reminded me of Tuscany but the architecture here was quite different. This is the farthest north that olive trees can grow. There is a microclimate right here in Arco that allows the olive trees to survive. Olive oil from this far in the north east tastes very different from the rest of Italy. Here it is buttery, mild, soft and lacks that peppery kick that we often associate with Italian olive oil. Wine production is prevalent here but the system for growing the vines and the varietals here are also different, much more in line with Germany an Austria, with the shining stars being whites. Wines from this region are difficult to obtain in the US as much less is exported from this region than any other in Italy. 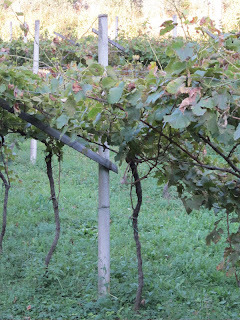 Note how the vines are directed up and out on an arm instead of split or forced to grow to their sides in a straight line. Reva and I loved our time with the Campetti family. This was our view from our bedroom. One night Reva and I made black bean burritos- a real treat in Italy! The entire family came over to experience our Tex-Mex adventure. 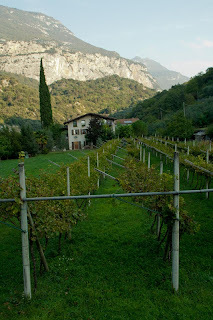 Our days were full with pruning the flower beds, clearing out the vegetable garden, cleaning the chicken coop, mowing the lawn (with a gas mower that did not like me) and learning all about the cuisine from the Trentino area. Oh and we also picked walnuts one day. Yes, these are walnuts! you must remove the icky black outer shell and then crack the inner shell in order to get the nut. YUMM!! Sausage and sauerkraut! I love this stuff. 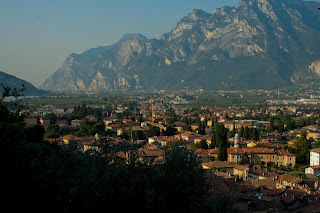 Just south of Arco is a town on the north edge of the lake called Riva del Garda. Reva loved this town because of the name and we both loved the location. We had a blast wandering around one day. It is a beautiful resort town with both mountains and palm trees! A perfect spot for the water enthusiast as well as the mountain lover. I decided to nap along the bank and take in the sunshine. Reva and I ended our trip with a bar crawl in Arco, enjoying delicious beer and local wine. Cin Cin!